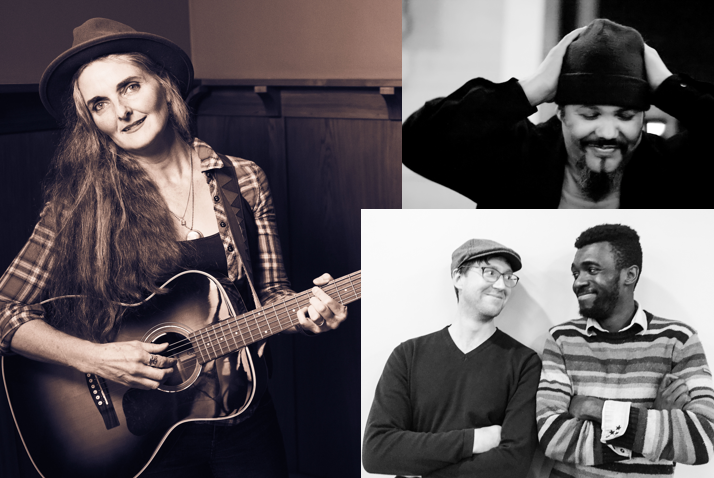 Songstress Jenny Van West who was good enough to play her new album at the Meetinghouse last Spring is bringing a host of Maine based International singer-songwriters to Georgetown for a great winter night of music. Three sets of different styles from musicians making an impression on the Portland music scene – and why go to Portland in the winter! We’ll have a special appropriate dinner option and our usual drinks. Doors open for dinner at 6 PM, show starts at 7 PM. Show tickets $12.50 in advance, $15 at the door. Jenny Van West “As a singer she could easily succeed at any vocal style she pursued and would destroy (in a good way) the great American Songbook if she chose to.” (Charlie Ricci, Bloggerhythms) Portland, ME-based Americana artist, Jenny Van West’s critically-acclaimed April 2018 release Happiness To Burn, fuses folk, rock, swing, and country in this follow-up to her award-winning 2015 album, Something Real. Van West has also dug into the musical community of her hometown, founding the Maine Immigrant Musical Instrument Project and the International Open Mic. A soothing yet riveting stage presence with a voice that engenders depth, compassion, and love, Van West has the ability to write songs that sound like instant classics. Carlos Olmeda hails proudly from the acoustic singer songwriter school of performance. The big difference between Carlos’ songwriting and performance styles and that of so many others is that Carlos’ music transports you to a wide spectrum of emotional and cultural destinations. It is almost inevitable that after his show, a fan will approach Carlos and say with genuine enthusiasm, “Wow! That was definitely not what I was expecting. How is it that you can change gears so effortlessly throughout your show?” He’s quick to point out that Tricultural Pop is all about changing gears and realigning perspectives. Gé Gé is a multilingual singer, songwriter, and guitarist based in Portland, Maine. His folk pop songs–with African, French, Italian and American influences–include vocal and instrumental improvisation with thumping bass provided by Jake Hoffman. Their sets rely on a heavy dose of Rumba Lingala, a classic Congolese dance music influenced by Cuban son. G’s acoustic guitar jumps between syncopated fingerpicking and jangly riffs that balance his diverse vocal expression–sometimes gentle and pondering, sometimes straining and heartbroken, and oftentimes cheery and laughing. G and J would like to say weebale, merci, grazie, and thank you to Jenny Van West for introducing them in 2017. Jake Hoffman is a multi-instrumentalist, singer, and educator from Pennsylvania who relocated to Maine in 2009. A scholar of American folk music and an advocate for arts access and cultural exchange, he teaches in his South Portland studio and is a program manager at 317 Main Community Music Center. Jake’s Appalachian and Southern string band projects have performed and taught in 25 states and 10 countries. In 2007 his band, The Powder Kegs, won a live talent contest on A Prairie Home Companion. His next ensemble, Tumbling Bones, was selected for two US State Department cultural diplomacy tours in Eastern Europe in 2014 & 2015. Jake’s more recent projects focus on exploring the process of decolonizing American folk music, combining American and international traditions, and collaborating with dancers and filmmakers. This week we are on the road to Morocco! Dinner will be a chicken and apricot tangine, served with couscous and a nice salad for $18 (includes tax and gratuity). Reserve dinner with your ticket purchase.